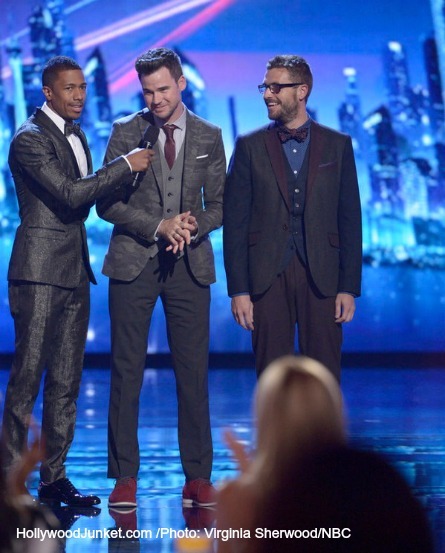 The first night of “America’s Got Talent” the Semi-Finals featured twelve of the 20 final acts, plus four Wild Card acts who are all vying for only six spots this week to stay in the competition. 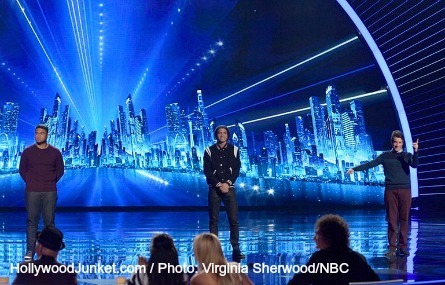 The judges brought back one “Wild Card” act each of their favorite act pick for a second chance at their dream. The first contestant performance of the night was Heidi Klum’s Wild Card pick – “Jump Rope Dance Crew”. 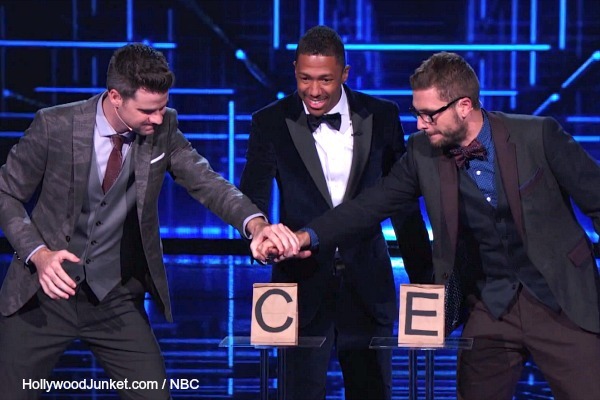 After Heidi and Mel B praised them for putting on an entertaining show, Howie was the only judge to point out that one of them fell and said “they have to be perfect!” Howard said he speaks for America, and explained why America didn’t vote for them “it’s similar every time. Every time, you act like you’re the background waiting for the star to come out.” He suggested to feature one of the crew members. The audience booed Howard. Mel b disagreed saying they did feature dancers. Mara sang “Breakaway” song by Kelly Clarkson. Heidi said, “She brought me to my feet in the middle of her song.” Howie also told her at only 12 years old she sings with more passion than people double her age. “You are exactly what this show needs!” Howie said. Howard told Mara that she redeemed herself this week and she is a “freak of nature.” Mel B said she did something smart with the song, she took it down and topped it up and called her an “amazing dropper!” Heidi said for her it’s not “Breakaway” it’s “break out” and sees her spreading her wings right into the finals. Mel B brought back “Bad Boys Of Ballet” as her Wild Card. They were beat-out by Jonah Smith last time. Howard told them as soon as the lead dancer (Adrian) left the stage, they lost momentum. He said, “you can’t run off the stage if you’re the gimmick.” Heidi loved it because it’s ballet in a new, modern way. Howie agreed, “if you don’t get voted on to stay, someone is going to pick you up as hot, back-up dancers”. Mel B said it was seamless. Adrian told Howard that she’s not a gimmick, then said she appreciates Mel B for taking notice to their hard work. Then, told Howie that back-up dancers can have their own shows not as back-up dancers. Paul said he’s thankful for making it back from battle in Afghanistan and it’s why he’s giving everything he has to the AGT competition. He sang “I Want It That Way” by The Backstreet Boys. Heidi said it wasn’t his strongest performance. Mel B said she could feel his self-doubt taking over. Howie told Paul that Mara, also in his category, did better than him. Howard said the low notes sounded disastrous. “This song was all wrong for you. This is not who you are,” Howard told him. Howie picked Mike Super because he said he “dazzled” him. After his second-chance performance as Howie’s Wild Card without Desmond, Howie said, “everything about this trick pleased me.” He joked the fact that Mike was in a sealed box pleased him too. He said Mike deserves the million dollar act. Mel B said he dazzled her. Howard made reference to Mike’s last performance on the show when Howard said he didn’t like Desmond. Howard said, “when I mean I’m not a fan. I hope he stays where he is. It’s Hocus Pocus…it’s jive. Now vote for him. Desmond is dead. Leave him there.” Heidi said it was a new trick and it was good. Mike said he feels fantastic and thanked the judges for their advice. Howie said “what I love about this show is that it’s called ‘variety show'” and that Andrey just showed them everything in that he’s an artist, a ballet dancer, a hand balancer…etc. Howard said that even without the use of words in Andrey’s act, the audience understands the emotion and his performance. “This is compelling every time I see it. It gets better and better,” he said. Heidi told Andrey he’s like a human pretzel and she would bend over backwards for him to go to the finals. Mel B noticed some “hiccups.” But, she said it didn’t matter because he is still captivated everyone and she was at the edge of her seat. Being Compared to Justin Bieber! Howard told him that he has the look that makes girls go crazy. He said, if it wasn’t for all that the audience would be “snoozing”, and advised him to go to club after club and find out how to be a good front-man. Heidi said America’s new “heart throb” has arrived. Howie disagreed with Howard and told Miguel that he has a great chance at winning the million dollars. Mel B said if you look at who’s out right now, he has that star quality. It’s not just about the look and compared him to Justin Bieber whom she said has the look and can sing. They explained that the name “Sons of Serendip” comes from four princes who met by accident and went on a trip together. 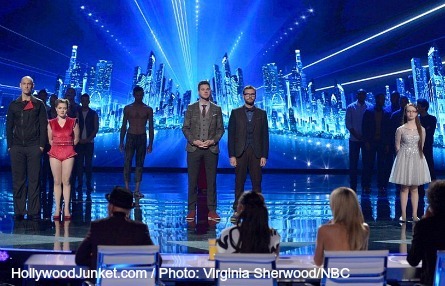 They call themselves a “happy accident” and call going on AGT an “adventure”. They consist of a piano player, harp player, a cellist, and a singer. Heidi told them “you sang so beautifully tonight” and that they have nothing to worry about. Mel B loved how they made the song their own and said they gave a “solid performance.” But was freaked-out by the Heavenly clouds on stage. Howie said they are by far his favorite, and compared them to Miguel Dakota “If the votes are dependent on talent – it’s them. If it’s a popularity contest, it’s Miguel. Howard said “this is a singer.” But, he didn’t like their group name. They are out to impress Heidi enough to make her stand-up this time. They put the pressure on Heidi to have to press the final “X” should they accidentally impale themselves during their trick. Howard called himself a “douche” by going for the “D” bag in their trick. Mel B said she loved it “from start to end.” Howie said “I liked it!”. Howard said he loved their delivery” and have seen other people do the same trick but not as good. Heidi said she was happy that she didn’t have to hit her buzzer or call 911. Dan himself is surprised that he’s still on the show. He said the show has build-up his confidence. His stand-up comedy routine consisted of dating jokes and other real-life scenarios. Heidi said she was offended by his German joke and didn’t laugh. Mel B said she started laughing at the end of his act and hopes that America votes for him. Howie defended Dan and said he IS funny. “You should buy into who you are” said Howard, and that he always looks forward to Dan coming on the show. Heidi and Mel B both said they liked the act more when there was less use of her partner in it. Heidi said she proved that she can do it and doesn’t need the help of her partner as much in her routines. Howard called the guy “great in the act” and said that Mel B and Heidi both have jet lag. He said “fantastic, and I hope you go on!” Howie said he agreed with everybody. He didn’t like that there was less action on the screen and said it was amazing what you can do with a hammock and crayons! Said she struggled for 15 years with her music career and says she’s not ready to give up on her dream. All of the judges were standing at the end of her performance. Heidi said “you have that special, old Hollywood-style” and a beautiful voice. Mel B said she topped her last performance. “Your voice is smooth and silky, I can listen to it all day long. Howie said “seasoned and iconic” is how he described Emily. Howard called Emily a “truly $1 million act,” and said Emily knows she’s a star and makes viewers want to vote for her. “America’s Got Talent” Results Show opened with a performance by Ariana Grande. 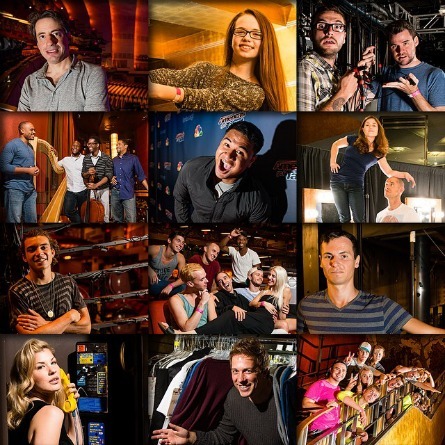 After that, it was a recap of the talented acts that performed on Tuesday’s show. The Snapple Save Acts are those that came in a 5th, 6th and 7Th and have the chance to be saved by live votes via Google. Ariel Animation, David and Leeman and Mara Justine are the acts that were “on the bubble” and in Jeopardy of getting eliminated. Flight Crew Jump Rope, Bad Boys of Ballet, and Mike Super were the first acts to hear their fates and if they will make it to the Top 12. Mike Super is the act that will be moving on. Mike said he is blessed and thanked everyone for voting. Howie took it as proof that he is “an amazing judge. The second act to make it through was between Andrey Moraru and Sons of Serendip. The act that will continue is Sons of Serendip. Heidi told them that she was right when she told Sons of Serendip that they had nothing to worry about, and that she was sorry to see Andrey go. Emily West, Paul Ieti, Miguel Dakota, Dan Naturman. The next act that was announced going into the Top 12 was Emily West. Emily said it’s a dream come true. Howard said “I said last night she is a million dollar act, and not much advice you can give to a front runner.” He advised her not to relax, and keep going full steam ahead. 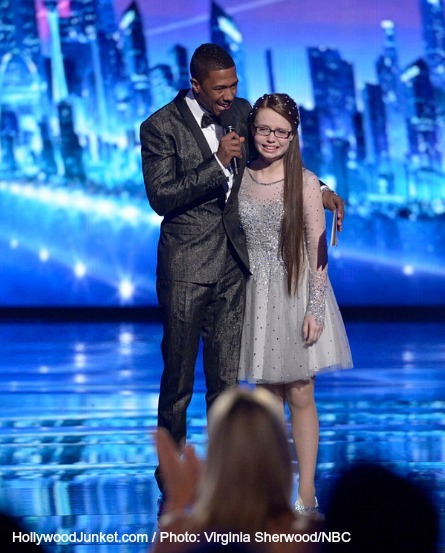 Pictured: Host Nick Cannon with Emily West. The three acts left were in danger of going home, and were up for America’s Snapple Save Vote – America voted to put through the fifth act which ended-up being Mara Justine. She reacted with tears and thanked everyone for voting for her. Howard asked her if she was okay because he was concerned of her being too young to take the pressure and advised her to keep doing the ups and down with her voice. The two acts left were Ariel Animation, David and Leeman. Judges Votes: The final act going through of the night depended on the vote of the judges. Aerial Animation and David and Leeman were the last two acts left. The judges made their votes. Heidi voted for David and Leeman, Howie chose David and Leeman, and Howard also voted for David and Leeman. That last vote made it official that David and Leeman would be going through to the Top 12!